Ceramic artist Kerryn Levy is inspired by the world around her. 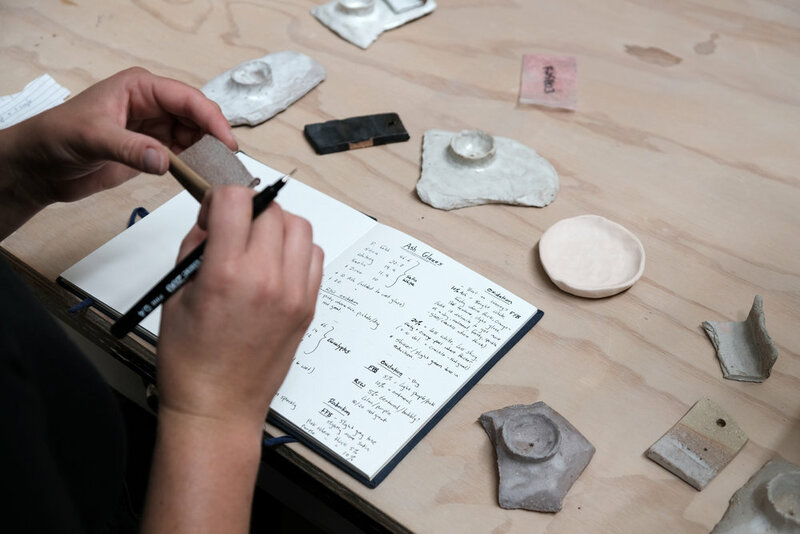 Born in Israel and living in more continents than most people have postcodes, it’s no wonder travel, movement and getting out in nature are what grounds her ceramics practice. Working out of JamFactory’s Studio #8 alongside fellow ceramic artist Connie Augoustinos, Levy’s work bench is surrounded with photographs and collected pieces from nature that she draws inspiration from. Works in progress line her shelves, grouped together as they sit best. 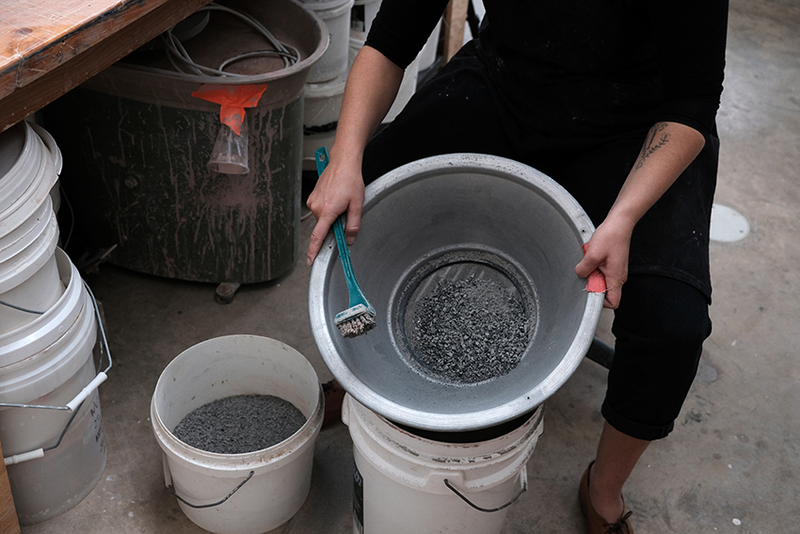 Levy happily moves about her studio documenting glaze tests, sipping tea and sifting charcoal from a friends fireplace. I was born in Israel to an Irish mother and Israeli father. My family moved to Ireland to live near my maternal grandparents when I was six, and then seven years later we moved to Adelaide. After graduating from UniSA with a BA in Visual Arts (Ceramics), I spent two years travelling in Canada and South America. 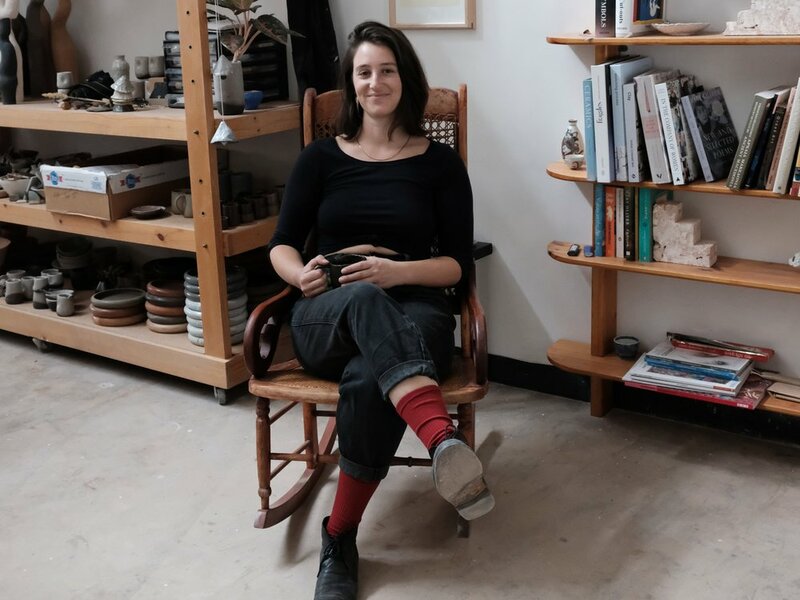 While I was living on Vancouver Island I joined a couple of ceramics studios and started selling my work at markets, that’s when I realised I wanted to pursue ceramics as a full time career. I decided to come home to Adelaide and apply for JamFactory’s Associate training program, which I completed last year (2019). I share the beautiful Studio #8 with Connie Augoustinos at JamFactory. We met briefly at Uni but became friends as Associates [at JamFactory], where we shared a workspace, exchanged ideas and influences and many cups of teas. We have our own space but also set up a shared work bench and an area to rest, read, design and sketch – it’s all part of the process. Our studio is inspiring, beautiful, functional and efficient – when we’re in there working we don’t want to leave! What or who are some of your influences? My main influences are the natural landscape and the human body. 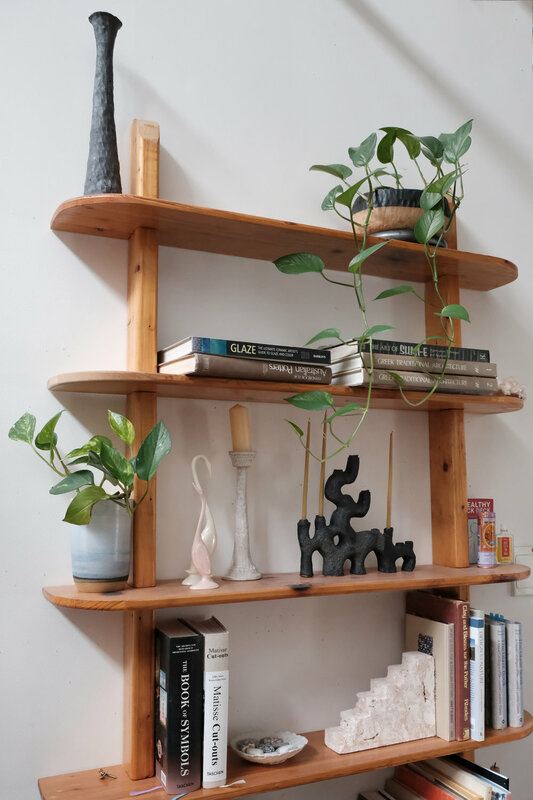 I’m inspired by other makers as well but I try not to look too much at what other ceramicists are doing and focus more on photographers, painters, writers like Ruth Bernhart, Matisse and Mary Oliver – my main sources of inspiration at the moment. The work I make usually ends up looking like an odd mixture of human, animal and botanical forms. The glazes I develop are often based on colours or textures that catch my eye in the Australian landscape – charcoal/burnt trees, various types of eucalyptus from ghost gums to stringy barks, and the natural ochres and deep reds of central Australia. I try to go on hikes or bushwalks quite frequently, especially if I’m visiting somewhere new – I think it’s the best way to get to know a place. I take a lot of photos that I might print out later, sometimes tracing certain lines or silhouettes that are interesting or I might focus on a particular colour or texture to try and capture in a glaze. Reading is important to me as well, about other artists or nature. At the moment I’m reading Mary Oliver, and looking at a bunch of books on Australian Flora. If I stay in the one place all year I feel my work starting to get a little stale so residencies are great for me to keep things fresh and find new sources of inspiration. It also gives me the opportunity to stop and just play and experiment, which is something I sometimes feel I don’t have the time for at home. I was lucky enough to be introduced to residencies last year when JamFactory sent me on a residency to Japan – the experience was invaluable. I’m going to try and do a residency in Mexico next year. Where/how do you like to spend your time outside of your studio? I love going camping or bushwalking on the weekend or if I have the time/money to go away and do a multi-day hike that’s the best! I also love staying at home and just doing nothing or going to the beach! Whatever it takes to recharge. Doing yoga a couple of times a week is great – making ceramics can be very strenuous on the body and I find yoga helps prevent injury in my body and helps me deal with work/life stress . What do you enjoy most about your medium? My making process is intuitive – I’m not much of a planner, and clay allows me to change my mind multiple times as I’m working. It’s slow and soft and pliable - I love that the marks my fingers leave in the clay during the making process are visible at the very end in the finished piece. 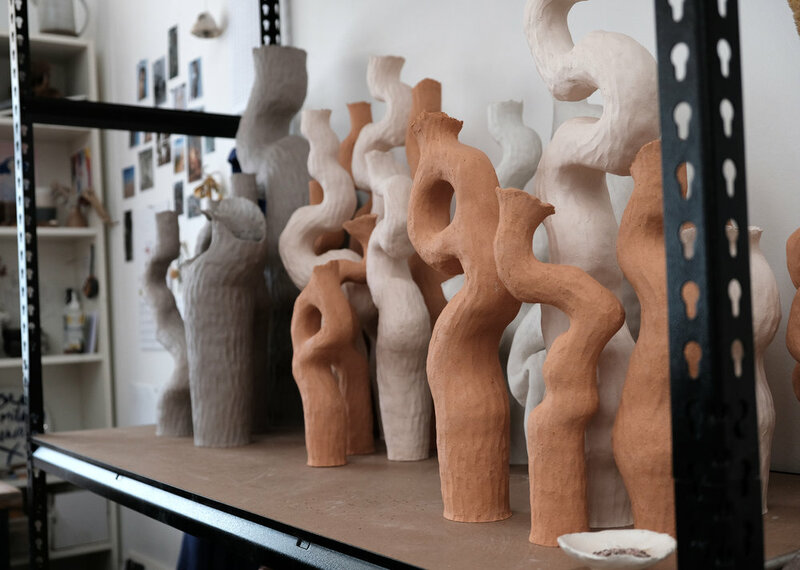 The versatility of clay is incredible, it can replicate so many other materials depending on how it’s finished – the world of glazes and surface decoration are endless. I also love that until it’s fired, clay can be broken back down and reused so the pressure of having made something that lasts thousands of years is slightly reduced! I’m currently making work for some upcoming exhibitions: Argillaceous Relations from 16 March - 6 April at Mr Kitly, Melbourne; Quintessence from 3 - 14 April - at Saint Cloche, Sydney and Endemic Earth from 1 May at Kingborough Council Art Space, Tasmania. I’ve got a couple of other projects I’m trying to find time to work on – I want to make a ‘Matisse Series’ as well as a series of work inspired by Mary Oliver’s poetry. Hopefully they come to fruition!